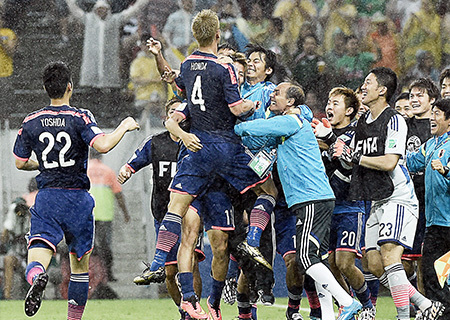 Honda made another mark in Japanese football history during Japan’s first match of the group stage. He scored a powerful goal off his left foot against Ivory Coast 16 minutes into the first half, giving Japan the lead. It was the second World Cup in a row that Honda scored the first goal of the first game on the day after his birthday. Honda became the first Japanese player to score goals in back-to-back World Cups, and now also holds the record for most World Cup goals scored by a Japanese player, at three. The goal was so explosive, benched Ivory Coast striker Didier Drogba found himself applauding, although in shock and disgust. However, Japan allowed two consecutive goals in the second half and lost. 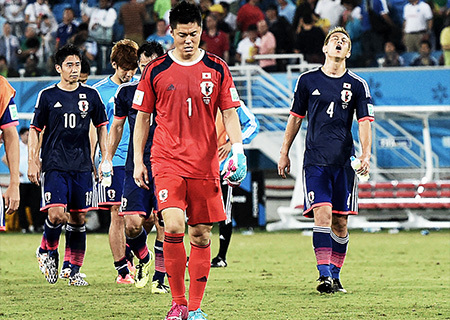 With one loss already, Japan could not afford to drop its second match, against Greece. As it rained, the Greek team was reduced to ten, with a player given a red card and sent off. However, even with a one-man advantage, Honda and his teammates could not penetrate a rock-solid Greece defense, resulting in a scoreless draw. The tie won them one point, but Japan lost their chance of making it to the tournament on their own. A miraculous comeback tournament qualification was hoped for, as the group stage began to wind down with the third match just ahead. Honda and the Japan national team took the field against Columbia with their hopes of moving on to the tournament stage pinned on a miracle. The outlook was grim, with Japan needing to beat Columbia. And even with an upset victory over the South American powerhouse, Japan’s fate would still have to be determined by the result of the match between Ivory Coast and Greece. In the additional minutes at the end of the first half, Shinji Okazaki scored a tying goal with a diving header off of a Honda assist. Momentarily, it appeared as though the miracle Honda was seeking could be in the works, but Columbia shut down all such hope with an additional 3 goals in the second half. The 1-4 score was a direct representation of the difference in level of football play, and Honda wandered the field after the game-closing whistle blew. Honda boldly spoke of winning the World Cup, And that made facing the brutal reality of a winless effort in Brazil even more painful. Honda, himself, knows this the most. What he told the world ended up being far from reality. The match results made it so. But this is the Honda way. And he has no intentions of changing. Honda has his sights set on Russia four years later – “We just have to work hard and trust that, by devoting ourselves everyday and by succeeding step by step, the fans will be willing to once again jump aboard the ship that is the Japan men’s national team – Japan’s football.” We will just have to wait and see if Honda will be at the helm again.